heterophoria in which there is deviation of the visual axis of an eye away from that of the other eye in the absence of visual fusional stimuli. adj., adj exopho´ric. (ek'so-fō'rē-ă), Do not confuse this word with esophoria. 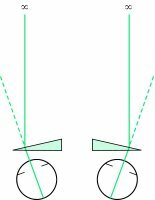 Tendency of the eyes to deviate outward when fusion is suspended. the latent lateral deviation of the visual axis of one eye outward. It occurs in the absence of visual stimuli for fusion. Also called divergent strabismus. Compare exotropia. exophoric, adj. A latent tendency for the eyes to turn outwards (diverge), but which is usually controlled by the binocular fusion power. If one eye is covered in exophoria it will turn outwards under the cover. Compare EXOTROPIA, ESOPHORIA. Turning of the eye outward from the active position when fusion is suspended. If symptomatic, treatment may be by means of base-in prisms, minus spherical lenses or visual training (Fig. E6). See convergence insufficiency; divergence excess. Moreover, Table 5 shows the number of successful and unsuccessful patients who had [less than or equal to] 10 PD exophoria 1 week and 6 months post surgery. When we included the cases with exophoria and esophoria [less than or equal to] 10 PD in the successful surgery group, the surgical success rate, which was 81. As another example, they may help an older patient whose long-standing near exophoria is decompensating due to poor sensory fusion from untreatable macular degeneration by prescribing base in prism. The fusional reserve that opposes the heterophoria should be measured first: base out to force convergence in exophoria. Many cases of decompensated exophoria can also be treated refractively, using a 'negative add'. Confusingly, in some literature a convergence weakness exophoria, or decompensated exophoria at near, is often described as a convergence insufficiency. This is particularly true for convergence weakness exophoria and convergence insufficiency.